Is there a better alternative to OpenLink ODBC Driver for Firebird? Is OpenLink ODBC Driver for Firebird really the best app in Other category? Will OpenLink ODBC Driver for Firebird work good on macOS 10.13.4? Use promotion code "ExpressPromo" at purchase time for discounted licensing! The OpenLink ODBC Driver for Firebird (Express Edition) is a single component installed on a machine hosting ODBC compliant applications such as Microsoft Excel, 4th Dimension, Omnis Studio, DB Visualizer, DB Designer, etc. The OpenLink ODBC Driver for Firebird (Express Edition) is a multi-threaded "Wire Protocol" Driver, enabling seamless out-of-the-box connectivity supported databases, and eliminating the need for the installation of any database-specific client networking software. KNOWN ISSUE: Cannot be used with PPC-native applications on Intel machines, due to limitations of Apple JVM. Use Lite or Enterprise Edition instead. OpenLink ODBC Driver for Firebird needs a review. Be the first to review this app and get the discussion started! OpenLink ODBC Driver for Firebird needs a rating. Be the first to rate this app and get the discussion started! 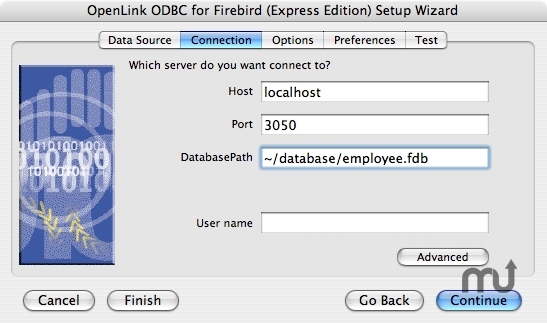 The OpenLink ODBC Driver for Firebird (Express Edition) supports connections to Firebird 1.x through 2.x, and has been specifically designed for Apple's Mac Universal platform. This Release implements try-and-buy functionality, greatly simplifying evaluation and enabling a smooth upgrade to a full license, at a low entry-level price.